The need for a quick means to add an esthetic clasp is apparent in todays society. Television has broadened our sensitivity to appearances and increased the demand for esthetics. 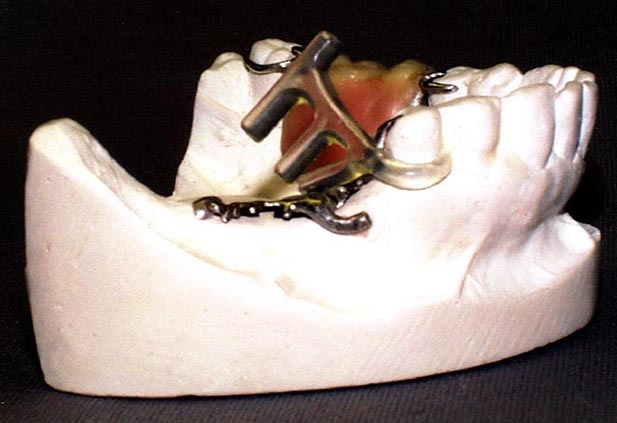 Many patients object to unsightly metal clasps but have to accept them because they cannot afford the high cost of fixed bridges. Prefabricated clasps may be the answer. Injection molded plastics are unique and far superior to conventional acrylics. 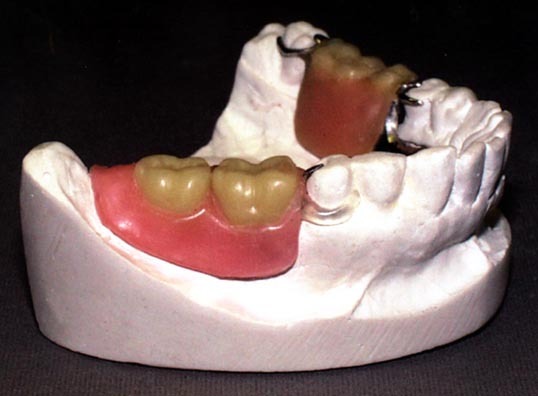 They have greater flexural and tensile strength and are now available for clasps and partials. 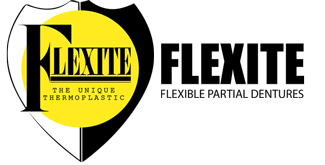 The clasp demonstrated is a Flexite Supreme nylon co-polymer thermoplastic which we call Flexite Clasp-Eze. Prefabricated clasp (Clasp-Eze), #221 Aron Alpha (bonding agent for nylon), Heat source (Electric heat gun or a small pinpoint flame), self cure acrylic powder (Flexite Rapid Set), self cure monomer and two dappen dishes. Note: Clasps are fabricated in one size. 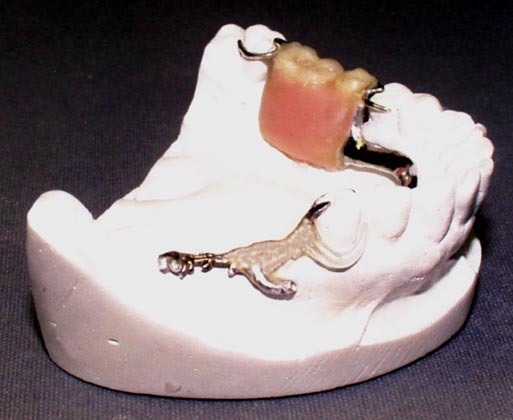 The tail pieces are spaced at different intervals and are utilized according to the size of the tooth. Example: The first tail piece would be cut off if the circumference of the tooth was bigger than normal and the second tail piece would be used. Illustrates lower stripped saddle with a broken Roach clasp. It may not be necesssary to strip an entire saddle, just a single tooth on some repairs. A Clear prefabricated clasp was selected for the demonstration. 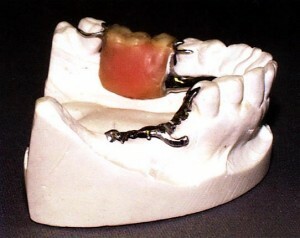 (Tooth color clasps are also available) The Flexite heat gun will soften the nylon clasp without blistering. A small flame may be used but requires more caution. Heat clasp by brushing up and back until the clasp begins to soften and goes limp. A good tip is to hold it against the flat side of the bench so the flow of air is concentrated and not lost. When flaming use top of bench as usual. 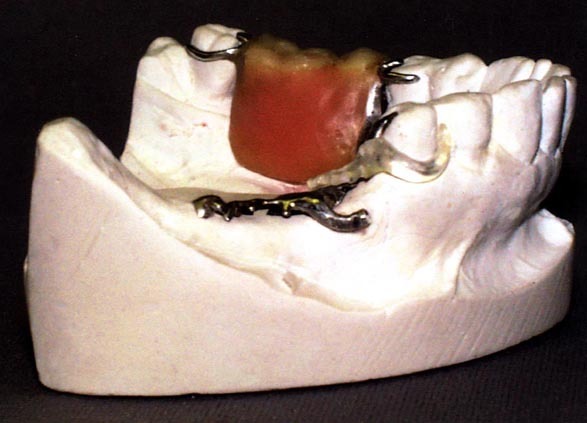 When softened, place tip into interproximal and bend toward distal. 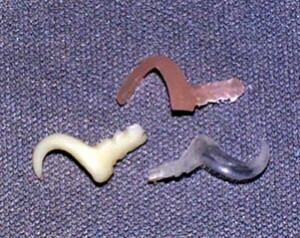 Tack tail section with wax so a plaster or stone matrix can be made on buccal. This will free up your other hand for postioning the tail piece section. Cut off the part of the clasp you are not using. Dovetail, shape and taper clasp. A properly tapered clasp will never lose memory and enhances retention. 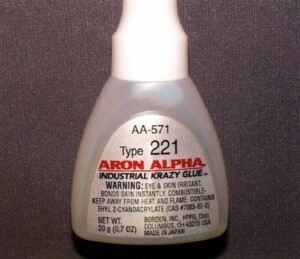 Paint the tail piece with Aron Alpha #221 (bonding agent). Allow to dry. 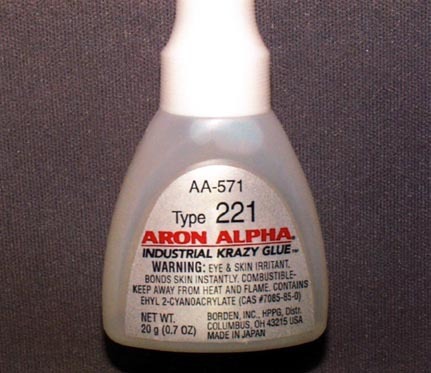 Aron Alpha #221 has a thin viscosity and dries quickly. Set clasp into proper position. 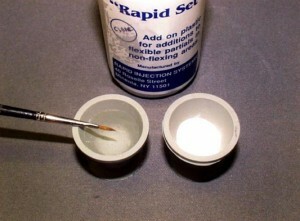 Lute to frame with self cure acrylic, the wet method with dappen dish. (Clasp-Eze) clear clasp cold cured to metal frame. Put into pressure pot: 20 lbs. pressure, 140 degrees fahrenheit, for 10 minutes. Completed waxup with clear clasp. 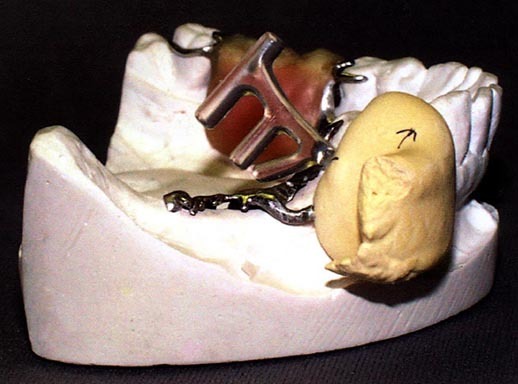 When adding Clasp-Eze to a metal frame, be sure to cut out the mesh behind the tooth you are clasping so the shoulder of the clasp fully lays up against the proximal wall of the abutement tooth.